This piece grew from a number of conversations with people of Austrian economic persuasion, mostly Bitcoiners and goldbugs (which these days seem mysteriously to have converged). I thought of calling this "Monetarism for goldbugs", but decided to preserve the mathematical slant of the previous pieces in this series. But it's monetary arithmetic, of course. And as Austrians tend to obsess about "sound money", it is specifically sound monetary arithmetic. In mainstream economics, "inflation" usually means a general increase in the level of prices. But it can also be defined as an increase in the supply of money. More money in circulation relative to the supply of goods and services means each unit of money has less purchasing power, which is equivalent to a general rise in the price level. Inflation, always and everywhere, is primarily caused by an increase in the supply of money and credit. In fact, inflation is the increase in the supply of money and credit. These statements are contradictory. Inflation is either caused by an increase in the money supply, or it is an increase. It can't be both. If you turn to the American College Dictionary, for example, you will find the first definition of inflation given as follows: "Undue expansion or increase of the currency of a country, especially by the issuing of paper money not redeemable in specie." In recent years, however, the term has come to be used in a radically different sense. This is recognized in the second definition given by the American College Dictionary: "A substantial rise of prices caused by an undue expansion in paper money or bank credit." 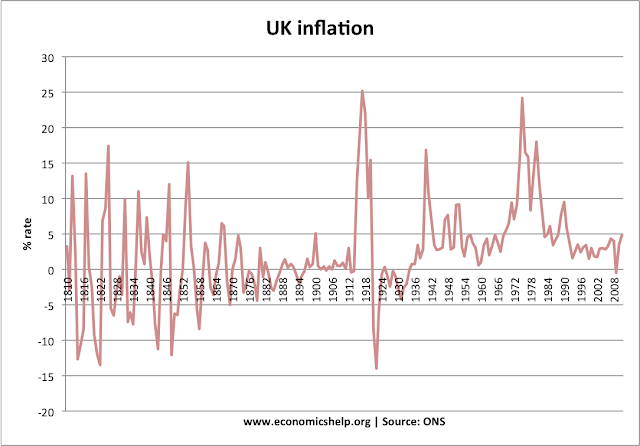 The word "inflation" originally applied solely to the quantity of money. It meant that the volume of money was inflated, blown up, overextended. It is not mere pedantry to insist that the word should be used only in its original meaning. To use it to mean "a rise in prices" is to deflect attention away from the real cause of inflation and the real cure for it. Hang on. In that last sentence, hasn't he used the second definition? Do make up your mind, Henry. Either inflation is caused by an increase in the money supply, or it is an increase in the money supply. It can't be both. This doesn't have anything to do with the "cure" for inflation. Under either definition, curing inflation may mean putting the brakes on money creation. But which definition applies does matter. If inflation is caused by money creation, then the purpose would be to end the social evil of inflation, not to restrict money creation for its own sake. But if inflation is money creation, then the purpose of restricting money creation would be purely to restrict money creation, regardless of the social effects. Inflation, as this term was always used everywhere and especially in this country, means increasing the quantity of money and bank notes in circulation and the quantity of bank deposits subject to check. But people today use the term `inflation' to refer to the phenomenon that is an inevitable consequence of inflation, that is the tendency of all prices and wage rates to rise. The result of this deplorable confusion is that there is no term left to signify the cause of this rise in prices and wages. There is no longer any word available to signify the phenomenon that has been, up to now, called inflation. . . . As you cannot talk about something that has no name, you cannot fight it. Those who pretend to fight inflation are in fact only fighting what is the inevitable consequence of inflation, rising prices. Their ventures are doomed to failure because they do not attack the root of the evil. They try to keep prices low while firmly committed to a policy of increasing the quantity of money that must necessarily make them soar. As long as this terminological confusion is not entirely wiped out, there cannot be any question of stopping inflation." For Mises, "inflation" is an increase in the money supply, and rising prices are the inevitable consequence of that inflation. where M is the money supply and P is the general level of prices. Note that in Mises' thinking this is not an identity. A rise in M causes P to rise, but not the other way round. So if M is fixed, P cannot rise. P is therefore a dependent variable. When the supply of money is increased, people have more money to offer for goods. If the supply of goods does not increase — or does not increase as much as the supply of money — then the prices of goods will go up. Each individual dollar becomes less valuable because there are more dollars. Therefore more of them will be offered against, say, a pair of shoes or a hundred bushels of wheat than before. A "price" is an exchange ratio between a dollar and a unit of goods. When people have more dollars, they value each dollar less. Goods then rise in price, not because goods are scarcer than before, but because dollars are more abundant. Unlike the first equation, this one is symmetrical. If production of goods & services falls, either M must fall too or P will rise. Conversely, if the quantity of goods & services produced increases, then either the quantity of money, M, must rise in line with the increase, or the price level P will fall. An alternative way of expressing this is to say that when there is a fixed money supply in a growing economy, the purchasing power of money will increase. Bitcoiners, who see the primary purpose of money as being to make the holders of money richer, love this. "Wowee, look at Bitcoin's market cap!" they say. But this is also too simple. Units of M aren't spent once then destroyed. They are re-used. So there isn't a straight-line relationship between the quantity of goods & services in circulation, Q, and the quantity of money, M, used to buy and sell them. The more frequently each unit of M is re-used, the more goods & services can be bought and sold for the same quantity of M. Or, alternatively, the more frequently each unit of M is re-used, the higher the prices of goods & services can rise. The frequency at which units of M are re-used is known as the "velocity" of money, V.
This is known as the "equation of exchange". It is widely used, and equally widely misunderstood. You can't use this equation to deduce what is causing prices to rise. It could be any combination of falling output, rising money supply and/or rising velocity. You can't assume that rising prices necessarily means the production of M is out of control. This equation doesn't tell you anything at all about what causes what. Nor can you assume that rising M necessarily means the central bank is printing money. It depends what you mean by M.
Central banks record several different measures of M. They are rather like a Russian doll: each measure fits inside the next one. The exception to this is M0, most of which is excluded from other measures of M, as we shall see. M0 is "base money" or the "monetary base", sometimes known as "outside money". It is the money created by central banks, or - in days gone by - governments. M0 is divided into two parts: physical currency in circulation, and bank reserves. All notes and coins produced by a government are base money, regardless of their composition. Thus, gold and silver coins produced by city-states in the 12th century were "base money", just as much as dollar bills are today. Before the era of electronic banking, bank reserves were also physical notes and coins. But these days, bank reserves are mostly electronic, though banks do have supplies of physical notes and coins so they can fill their ATMs. So M0 is divided into physical and electronic money, of which electronic money is by far the larger proportion. Bank reserves have been vastly increased by quantitative easing. Banks now have far more reserves than they need to settle customer deposit withdrawals, which is the sole purpose of reserves. Since 2008, the Federal Reserve has paid interest on these excess reserves: other central banks have done so for even longer, though before QE banks didn't tend to have much in the way of excess reserves. Most base money, M0, is therefore now interest-bearing. Only physical notes & coins remain interest free. M1 is what most people regard as money, namely the money in their current (checking) accounts and in their wallets. It does not include bank reserves, because bank reserves are not "in circulation". M2 is M1 plus short-term saving accounts and overnight money market funds. M3 is M2 plus long-term savings accounts and money market funds with a maturity longer than 24 hours. M4 is M3 plus other deposits. M1-M4 are collectively known as "broad money" or "inside money". All broad money except legal tender notes & coins is created by commercial banks: in Scotland and Northern Ireland, some banknotes are also created by commercial banks, though these are not legal tender. Bank reserves are not part of broad money. Central banks don't necessarily report all the categories of broad money. The Federal Reserve, for example, currently reports M0, M1 and M2: it used to report M3, but stopped doing this in 2006, saying that M3 didn't appear to add much in the way of useful information and it wasn't worth the time and cost of producing the figures. The ECB currently reports M0, M1, M2 and M3, and the Bank of England reports M0, M1, M2, M3 and M4. But whichever definition you use, a statement like that tells us absolutely nothing about price rises. Nor does this chart. Increasing the money supply, whether M0 or any other M, does not automatically mean that prices rise. That depends on the behaviour of the other two variables in the equation of exchange, Q and V.
Output, Q, is notoriously complicated. For nations, it approximates to real GDP (RGDP), which is the estimated monetary value of goods & services produced in a specific period, adjusted for inflation. RGDP is notable for revisions, inconsistencies, omissions and opinions. The contribution of services to RGDP is particularly ephemeral. Measured RGDP can also be significantly - and sometimes hilariously - affected by changes in the law. In 2014, Italy emerged from recession when prostitution and drug-dealing were included in its RGDP. And Ireland's RGDP rose by 26% when, under pressure from the EU, the Irish authorities changed Apple's domicile for tax purposes from a cloud somewhere above the Caribbean to Ireland. I am increasingly worried by the extent to which both fiscal and monetary decision-making is driven by a measure as volatile and error-prone as this. I would also hate to think that anyone would use RGDP forecasts to determine the money supply. The equation of exchange is an identity. Thus, output is as likely to be determined by money supply as money supply is to be determined by output; and both affect, and are affected by, the price level. These variables are inextricably linked; the relationship is complex and the direction indeterminate. If you adjust M in response to expected changes in Q, both Q and P can end up changing in unpredictable ways. Messing around with the money supply in response to RGDP forecasts is a mug's game. To be fair, the Austrian school aren't in favour of messing around with the money supply in response to RGDP or anything else. They are quite happy if prices fall because Q is increasing while both M and V remain fixed: this is the "benign deflation" that they think happened during the classical gold standard of the late 19th century. Falling prices can be good news for consumers, though not if falling prices flow through into falling wages and unemployment, which is what actually happened in the late 19th century. The "Long Depression" was miserable for a lot of people. But, in practice, general over-production, as popularly imagined, has never, so far as I can discover, been a chief cause of great dis-equilibrium. The reason, or a reason, for the common notion of over-production is mistaking too little money for too much goods. Fisher shows us that when there is too little money in circulation for the amount of goods & services produced, and no more M can be produced, the result is economic depression. I do have some sympathy for those who say "just fix M, and let P and Q sort themselves out". But there is another, better, way - and that is to allow M to respond to the demand for money. We can regard velocity, V, as an expression of the demand for money. The higher the velocity of money, the lower the demand for it. When demand for money falls towards zero, people dump money in favour of goods & services as fast as they possibly can. We call this hyperinflation, though "hypervelocity" might be a better name for it. Hyperinflation causes immense economic damage and leaves deep scars. It is rightly feared. At the other extreme, when people hoard money and refuse to spend or to invest in other assets, prices of goods & services collapse, output collapses because businesses are unable to sell their goods & services, and the economy enters a depression with high unemployment and widespread defaults on fixed obligations such as debt. This phenomenon goes under many names. Keynes called it the "liquidity trap", because people's preference is to hold money rather than riskier assets. Irving Fisher termed it "debt deflation", although its principal characteristic is price collapse. We might call it "hyperdeflation". The most famous example is the Great Depression in the US in the 1930s. It is rightly feared. But these are extremes, and they are rare. Most of the time, the velocity of money is a benign indicator of activity in the economy. If Q rises more than M, it's entirely possible for V to increase rather than P falling. Alternatively, falling V can mean fewer transactions, which is a sign that the economy is slowing down. If prices have been rising, then falling V could signal a welcome slowdown. But if they have not, then falling V could mean a recession. In fact this chart shows that V has collapsed since the Fed started targeting inflation in the early 1990s. It's hardly surprising that commercial banks were able to expand credit in the 2000s without price inflation taking off, and that since the 2008 financial crisis the Fed has been forced to replace commercial banks' money creation with public money creation on an unprecedented scale. Money simply isn't circulating at the speed that it did when inflation was higher. It remains to be seen whether V will pick up as the Fed shrinks its balance sheet (there is some evidence that QE depresses the velocity of money). If it doesn't, then unless there is a return to the excessive credit creation of the 2000s, the equation of exchange suggests a gloomy outlook for the US economy. Clearly, particularly since the mid-1990s, V has been anything but fixed. However, many economists treat it as fixed. This has an unfortunate effect. Treating V as fixed results in overstatement of the contribution of M to inflation. "Inflation is always and everywhere a monetary phenomenon", yes, but that does not mean that the quantity of money in circulation is the only important variable. The velocity of money matters too. Money must have velocity, or it cannot function as a medium of exchange. When money is so scarce and illiquid that its velocity falls towards zero, people create new forms of money for transactions. This is what is currently happening in the cryptocurrency world. As Bitcoin becomes more illiquid and less usable as a medium of exchange, people are turning to other cryptocurrencies. In fact they are creating them. Lots of them. One of the unintended consequences of the complete lack of regulation in the cryptocurrency ecosystem is that there is unlimited money creation. Anyone can create a cryptocurrency, and far too many of them are accepted, mainly in my view because of an implied link to the US dollar which effectively gives them value that they don't deserve. In 1896, William Jennings Bryan had to use the political system to try to get an alternative coin issued for use by poor American farmers for whom gold coins were too scarce and expensive. Despite his fiery speech, he failed to get political agreement for silver coinage to be issued. But all a cryptocurrency user has to do is produce a bit of code and a white paper, and hey presto there is a new coin. Even if individual coins have issuance limits, the fact that new cryptocurrencies can be created without restriction means there is effectively no limit to the money supply in the ecosystem as a whole. This is in stark contrast to the fiat currency system, where central banks at least try to limit the creation of money by commercial banks, though not always successfully. In the cryptocurrency world, no-one even tries to control M.
Of course, Bitcoin maximalists like to pretend that nothing except Bitcoin constitutes money. This is understandable, but not consistent with the Austrian economics they claim to espouse. Both Mises and Hazlitt said that M is the sum total of the money created by all money creators in the economy. By analogy, therefore, for the cryptocurrency ecosystem, M is the sum total of all coins, not just Bitcoin. And by Austrian standards, the cryptocurrency ecosystem's production of M is frighteningly out of control. Bitcoin itself is inflating more slowly than it did two years ago, because the block reward has halved, but the cryptocurrency ecosystem as a whole is hyperinflating. Unsurprisingly, so are its prices. Other stablecoins are pegged to strong cryptocurrencies such as Bitcoin or Ethereum, or even to the US dollar. The problem, as with all currency pegs, is holding the peg. Do these coins really have the reserves to guarantee exchange at the pegged rate? But in fact, there is a far more powerful "stablecoin" underpinning the cryptocurrency ecosystem. This is why cryptocurrency prices herd together, and why the price trend is ever upwards despite intermittent crashes. Ever wondered why cryptocurrencies are valued in dollars? Why cryptocurrency HODLers rejoice at the "market cap" of their coin in dollars? Exuberant coin creation is made possible by a wholly irrational belief that there will be enough US dollars to enable everyone who has bought into this hyperinflationary ecosystem to cash out at its vastly inflated prices. Whatever Bitcoin maximalists may claim, the cryptocurrency ecosystem's anchor is not Bitcoin, it's the US dollar. 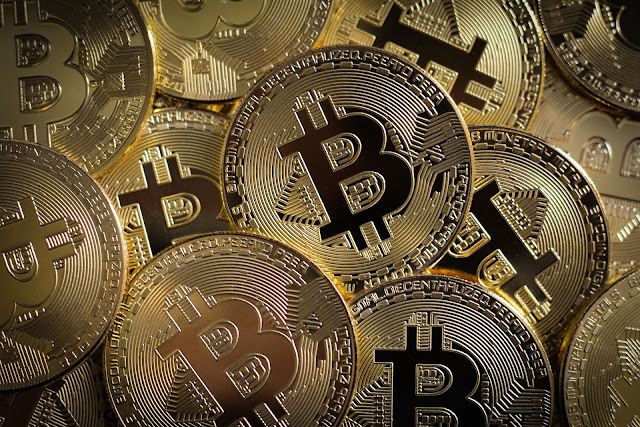 And it is not Bitcoin's "sound money" that enables cryptocurrency prices to rise to dizzy heights, but the assumed backing of the Federal Reserve for the faux dollar liabilities being created. But the US taxpayer has not agreed to support this system, and is highly unlikely to do so. At some point, there will be a reckoning. Firstly, inflation is complicated because money is complicated. Defining inflation as "increase in the money supply" doesn't eliminate the complication. Secondly, setting a hard limit on the supply of money does not prevent inflation, if people can respond to the restricted supply by creating alternative moneys. Note that I am using the Austrian definition of "inflation" here. If you evade a hard limit on one kind of money by creating another kind of money, you have increased the money supply. Finally, influencing the demand for money is a pretty good way of managing inflation. After all, if you can dampen demand for money, people will be less likely to create alternative moneys to evade a hard limit. Even for Austrian economists, price stability is the real concern. Mises wanted to restrict money creation because he thought it was the only way of ensuring price stability. But if there were a better way of controlling price rises than restricting the money supply, he would surely choose it. But how to do this? In the Bitcoin world, interest rates wouldn't be the right tool, and I've already discussed the limitations of stablecoins. Perhaps exchange rates could be a limiting factor. Or perhaps the Federal Reserve should flex its muscles. If cryptocurrency investors knew that the coins they have bought have no guaranteed dollar exchange value, prices would come down remarkably quickly. Rather than pretending that the only "true" money is Bitcoin and ignoring the growing evidence of out-of-control inflation in the cryptocurrency ecosystem, perhaps Bitcoiners could give some thought as to how the demand for coins can realistically be managed so as to prevent a disastrous crash when US dollar support for their ecosystem is withdrawn. * Mises' thinking is more nuanced than this quote implies. Sadly, however, that of some of his followers is not. If I had a bitcoin for every time I have heard a Bitcoiner or goldbug say "when the Fed increase the money supply, prices rise", I would now be very rich. ** To be fair, it is not just the producers of stablecoins who think they can control the price of money solely by adjusting the supply. "Sovereign money" proponents tend to think so too. So do some monetarists. Image from Pixabay, with permission. My executive summary: You can create as much money as you like but unless it gets *spent* don't expect prices to change. Frances , I agree with you except in one point. Q can never = GDP because there is an enormous number of transactions with money that are not register in GDP, for example, speculative transactions. These are not value added, an GDP are only value added transactions. All money expended in stock market are speculative, except the first time that they are emitted. The same is true for all good & services buoyed in secondary marked. They don’t enter in GDP. M = P*GDP is flawed. So, it is true that an increase in M & V could increase GDP, but is very difficult to measure. I completely agree. Indeed I said "approximates to GDP" rather than "is GDP" for exactly this reason. GDP is a seriously flawed measure. It's one of the reasons why the quantity theory of money gives such unpredictable results. A most interesting piece. How does all this apply to house price inflation. An Australian economist recently remarked before the Royal Commission on Banking that " The price of housing is a function of the demand for and supply of credit not the demand for and supply of housing ". Would you agree with that observation? No, I wouldn't. It's every bit as simplistic to claim that house price rises are due to oversupply of credit as it is to claim that they are due to undersupply of housing. It's also demonstrably untrue in London, where house prices have been driven up by cash buyers. I enjoyed this piece very much and am new to your blog. I agree entirely about the simplistic nature of such binary claims to the cause of pricing housing - although the preponderance of cash buyers in London does not disprove the theory of easy credit being the sole cause of house price inflation (its a major cause , not sole cause , im just making the following point : ) cash is proceeds from an easy credit monetary system (whether the cash came from China , UK , US , Russia , EU , it was all loaned into existence at a multiple. Cash buyers , overwhelmingly being the top 1% or top 0.1% , just get the benefit of the credit system before the rank and file. Ergo , cash is a form of credit: whether its profits garnered that easy credit helped create or excess credit not yet deployed. I guess what im saying is all cash is a by-product of a fractional reserve debt money system. You mention "the assumed backing of the Federal Reserve for the faux dollar liabilities being created" and later "US dollar support for their ecosystem". Can you elaborate on that please? Cryptocurrency investors expect there to be an unlimited supply of dollar liquidity so that they can cash out their holdings into dollars whenever they want. This is also true of other currencies to a lesser extent, but the US dollar is the international currency standard. It is also currently the unit of account for cryptocurrencies, as it is for commodities. When new coins are created in the expectation that they will always be exchangeable for dollars at their market price, either directly or via other cryptocurrencies (BTC, ETH, stablecoins), they are effectively dollar liabilities. However, they do not have Fed backing and the creators of the coins are unregulated and unlicensed. They are therefore faux dollar liabilities in the same way that securities created by shadow banks before the financial crisis were faux dollar liabilities. There is absolutely no guarantee that they will be exchangeable for dollars at all, let alone at the prevailing market price. There is no dollar support for the cryptocurrency ecosystem. The Fed does not back it, and neither do US taxpayers. Neither coin creators nor exchanges have guaranteed liquidity, and coin deposits on exchanges do not have FDIC insurance. There is no principal protection for cryptocurrency investments. But the ecosystem's price structure implicitly assumes that the Fed will provide enough dollars to enable cryptocurrency owners to cash out. No it won't, and it is high time the cryptocurrency community understood that. There's obviously no dollar backing by the Fed or the government/taxpayers or anyone else for that matter for crypto coins, agreed. But there's no such expectation or promise either. They will however always be exchangeable at their market price, but there's no guarantee for what that price will be. It could very well be (close to) zero. In that sense they are not very different from a stock or a commodity. There's no principal protection or FDIC insurance for such assets either and they could also very well lose most of their value. So I'm still not sure what your comment refers to. It it's about a misconception by some "investors" that their newly bought tokens won't drop in value, fine, critique it. But I'm not sure even that is the case. And for the ecosystem as a whole, there's no perception of dollar backing, implicit or explicit, any more than the general asset support (even for pure bubble assets) that loose monetary policy provides. Not sure if it's a typo, but isn't RGDP inflation-adjusted? Surely it's nominal GDP that doesn't account for inflation? Apologies, my wording is unclear. I will revise. Thanks. "Bitcoiners, who see the primary purpose of money as being to make the holders of money richer, love this"
well, yes. But these days that seems to mean most Bitcoiners. For a social creditor inflation can be seen as a rise of GDP or total prices . Net income is all that matters to people. As Soddy explained it is the was of energy required for distribution in a wasteful mercantile system which is at the root cause of the net consumption crisis. Laughably neither the Austrians or monetarists and indeed all conventional economists never address thermodynamics in any shape or form. We can safely assume all economics is therefore bunk. Soddy addresses the problems of the existing system of false accounting ( balance sheets are not found in nature) in his introduction to " The Role of Money"
My only critique of Soddy in this book is a inflationary bias as he does not quite get the distributionists and the potential flow of deflation back into the community . Nevertheless the final few pages cut to the quick . "The monetary system is actually based on the very error to the point blank denial of which western civilization owes its greatness"
One of the problems with doing anything based on RGDP is that its operational definition is GDP less inflation - so you have to know the GDP deflator before you can compute RGDP. If you make statements about RGDP you implicitly make statements about measured inflation. Hi Frances - great article. Lucid as always. The link you provided to the article on why it is broad money that matters for inflation and not the monetary base doesn't work - please could you provide an alternative link? I have always struggled to understand how people arrive at the notion that M0 matters for inflation. It is abundantly clear that we use broad money to pays for goods and services, not monetary base, so ultimately changes in broad money are what shift prices. I wonder who is still arguing the case after massive increases in reserves have led to almost no inflation. Hi Chris, the article was on Pieria, which I've now discovered was taken down by the host a few days ago. I have reposted the article on Coppola Comment from the Word original, and updated the links in this post.